Close more Telephone leads and build meaningful customer relationships. Increase phone Call conversions and customer satisfaction with Akiba Interaction. 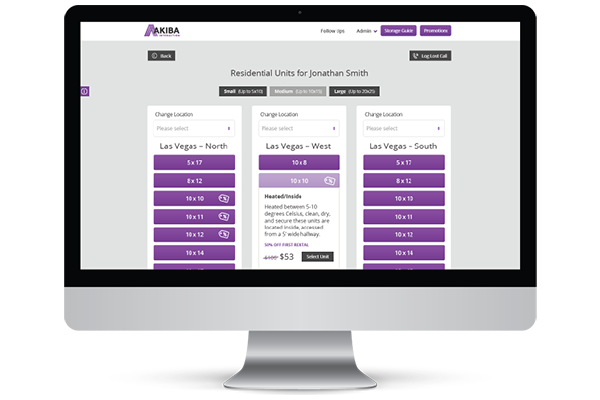 This interactive lead management application comes equipped with the ability to close more leads and simplify the sales process through a unique and customizable user interface. AKIBA Interaction is a web-based Customer Relationship Management (CRM) solution for self-storage operators. With the assistance of the SiteLink API, AKIBA Interaction ensures no lead is left unattended. With its built-in, multi-channel follow up process, AKIBA Interaction helps you create more meaningful and lasting relationships with your customers. No Client Is Left Unattended With Akiba Kiosk. Allow your facility to service its clients 24/7 using our web-based kiosk application. With built in two-way video conferencing no client will ever be disregarded or neglected.